Raumfahrt Concret is featuring us! 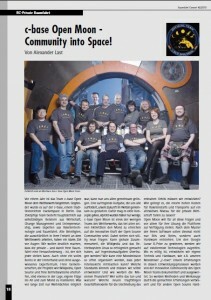 The German speaking magazine Raumfahrt Concret, the only one related to space topics publishes in their latest edition an Open Moon paper. Thanks to Raumfahrt Concret for their kindly permission to publish the paper right here. Introducing the Open Moon Design Commoonity. gave a the GLXP-Teams a warm welcome speech at the Summit. …but my commoonity stated, this is Youtube Art. Past weeks were busy ones for Open Moon. We ran a booth on LinuxTag in Berlin and a Breakout Session on Future Forum Dresden as well and sent a competent EVA team to the ILA 2010. Our efforts have been rewarded: Commoonities are growing and the project is gaining speed. A small reel showing the modified moon rover `c-rove´ performing some lunar action. This animation was on display on our booth at LinuxTag 2010 in Berlin and generated a lot of interest. Open Moon Communicator Alex gives a statement of efforts and outcome of LinuxTag 2010 in Berlin. Open Moon Design Comoonity is just experimenting with 3D-animations. This is the first test. Please be sure to use anaglyph red(left) cyan(right) glasses to watch this clip correctly. brought us this Photo Album. “Last, but not least”: A summarize of Open Moon´s Breakout Session “Community into Space” by Ranga Yogeshwar, host of the Future Forum Dresden. Our team was unexpectedly added up. 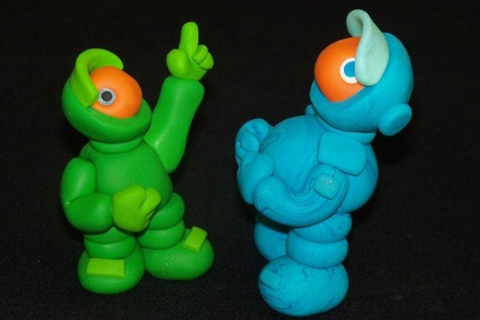 Lunik (green) and Ranger (blue) are our new mascots! Our new heroes are named after the first russian and american probe landed on moon. On 1959/09/13 Lunik was the first artificial device ever touching lunar surface. Ranger followed on 1962/04/26 with a touchdown on the dark side of the moon. We are very happy to welcome our new sponsor TresCom Technology! TresCom provides us with technical facilities and ressource logistics. We will have access to the knowledge of a team experienced in communication and traffic engineering. We think this is an important step towards technical realization of hardware modules. …and thank´s for your true interest in collaboration! “…to touch Moon, asteroids and beyond.” Peter Diamandis, X-Prize Founder to the GLXP-Teams at JPL, Pasadena. c-rove is now labeled by OHANDA!